I remember, as a child, going downtown with my parents and walking into Nance’s Five and Ten store. I recall entering through the huge door with the big glass insert and stepping onto the old hardwood floors that creaked and groaned as I walked to the main attraction – the penny candy display. I can recollect the clerk reaching for that small, brown paper bag and filling it up with whatever candies I pointed out to her. If I close my eyes really tight, I can still sniff the delightful smells of that old store. Sadly, that store has been closed for quite a while, but every time I visit my mom and dad in my hometown, my mind is flooded with the wonderful memories of an idyllic childhood lived in a perfect (in my opinion) small town. 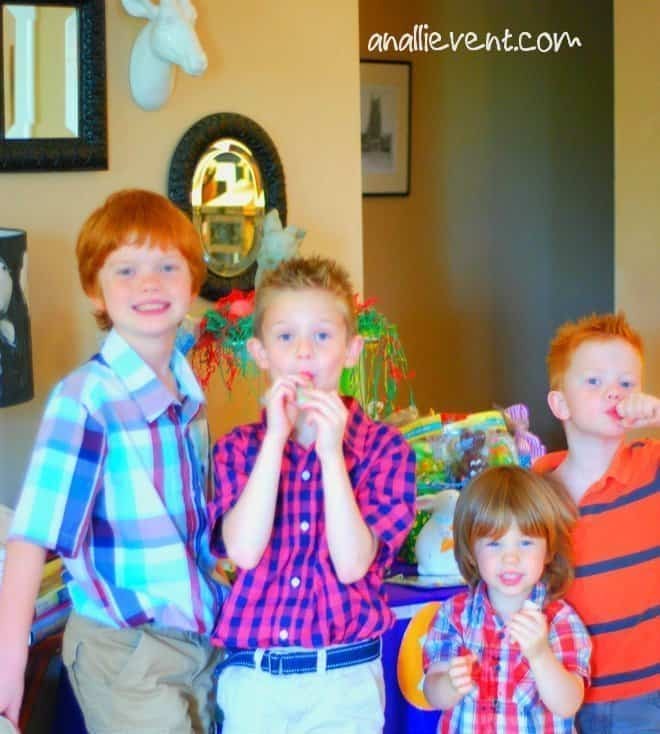 All of that reminiscing led me to create an Easter candy buffet for my grand sons instead of making them an Easter basket. 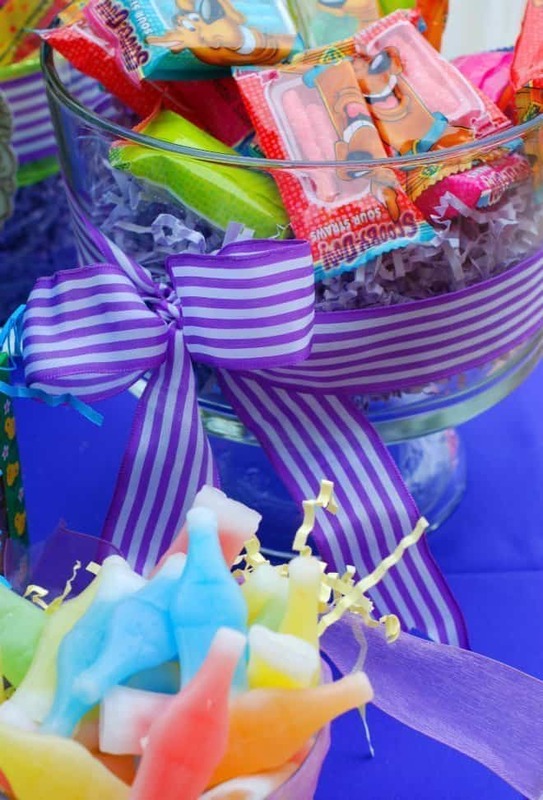 Have you ever put together a candy buffet for a special occasion? If so, then you know that the cost of candy and the display jars can be astronomical. And because I’m a shopping pro, (you can find my shopping steals and deals here) I decided to see how cheaply I could put it together. 1. Choose your serving table. Will you use a square, round, or rectangle table? 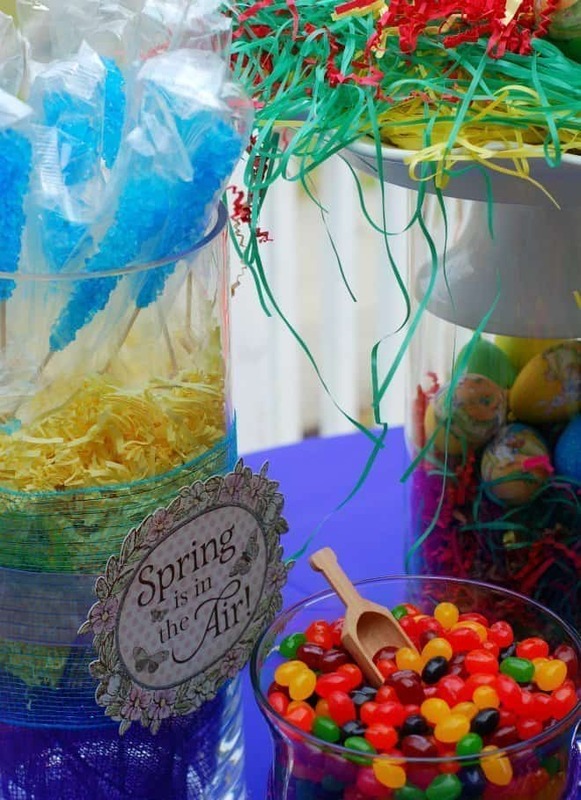 Most candy buffets are set up on large rectangular tables with elaborate backdrops, especially when the event is large (like a wedding reception) but, because my Easter candy buffet is on a much smaller scale, I decided to display my candy on a small round table. You do know that I’m a rebel with a cause, right? Find it here! Plus, I only have four grandchildren, so I really don’t need an excessive amount of candy. 2. Estimate how many containers you will need. This is easily done by using different size bowls, etc. from your kitchen to play around with the placement on your table to see how many containers you will need. Be careful not to overcrowd. 3. Gather your containers and scoops. Containers need to be see through, because the candy is the star of this show. Make sure the opening of the jar is large enough to get a hand, holding a scoop, down into the jar. Containers can be expensive! I scouted my kitchen first and then bought what containers I needed at The Dollar Tree and they are just as pretty as any of those costly containers I’ve seen online. Don’t hesitate to look at vases, triffle dishes, wine glasses, etc. If candy is individually wrapped, there is no need for a lid. For the short zone (we will get to that later) pretty trays and tongs can be used. You will need about one lb. of candy for every 2-3 guests. Do you want all of your candy to be one color? Or do you want it all to be chocolate? Do you want to include nuts and dried fruit? The average assortment of candy depends on how large the candy buffet is. I say: Have at least 5 different kinds. You will need a pretty table cover to match your theme. I just so happened to have a purple tablecloth on hand, so I used it. To add texture, layer with overlays and/or a table runner. When using a round table, the tallest glass jar goes in the middle of the table (or you could use a tall centerpiece). That is zone one. Medium size jars are placed around the centerpiece and that is zone 2. Zone 3 completes the table and is, of course, the shortest jars or trays lining the outside perimeter. Don’t be afraid to mix it up. The jars don’t have to be the same height or shape. Just make sure the tallest is in the middle and work your way down to the shortest. 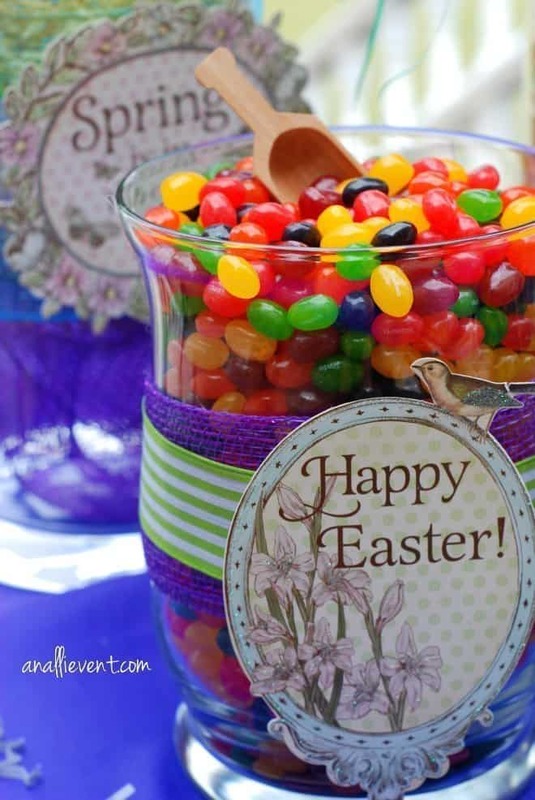 Also, make sure that the candy is reachable and that the table is not too cluttered. Simple, neat and clean lines is always my motto. If you are using a square or rectangle table, the tallest jars go in the back, the medium sized jars in the middle and the short jars/trays out front. Note: There are plenty of places online to order candy: Candy Warehouse, Old Time Candy, Old Fashioned Candy, Oriental Trading. And the list goes on! My ribbon and Easter garland came from Hobby Lobby. Some of my candy was ordered online, some of it came from Sam’s and the bulk of it came from The Dollar Tree. I had to make myself stop buying candy! First off, I LOVE the candy table, it is really pretty and enticing! Second, you have won the Grandma of the year award! We had to show them how to “drink” those little wax bottles! They had never seen them. It was a beautiful display and the boys loved it. It was so enticing for the little ones. They kept going back for more. Lol Great job, Mom! That’s so adorable, what a great idea! Thank-You! 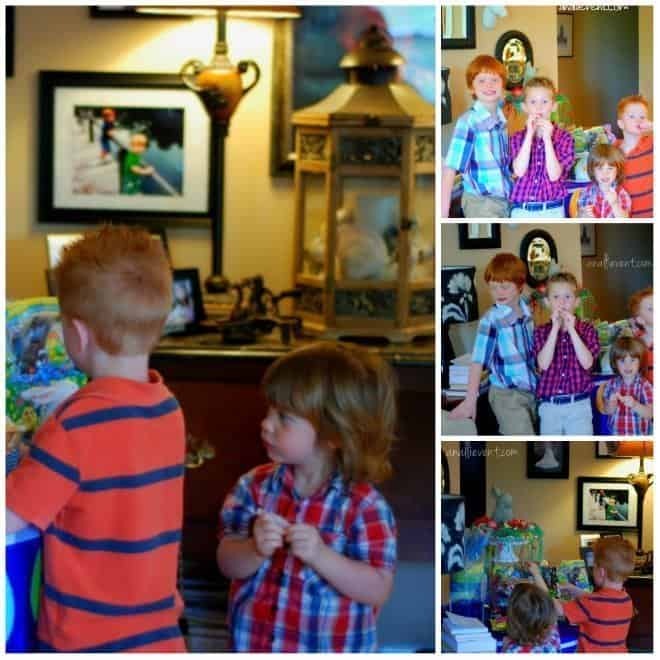 I’am planning on doing the same for My Grandchildren instead of Baskets,You gave Me some great ideas! 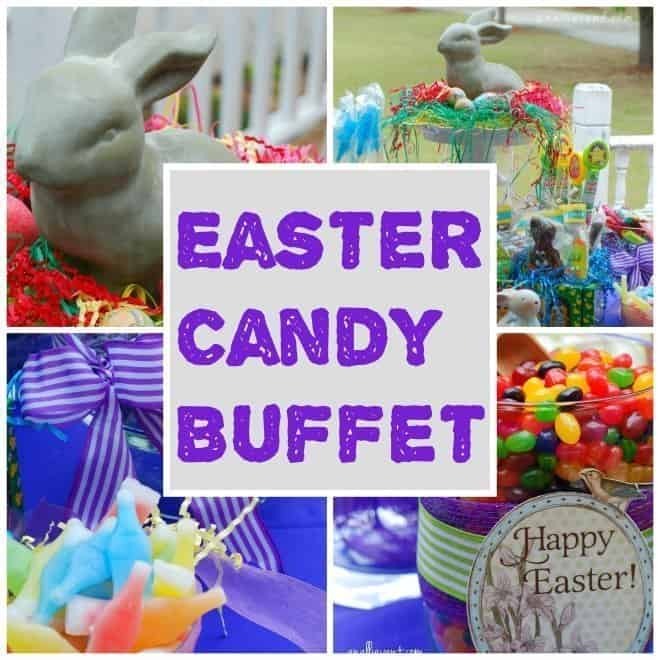 Who wouldn’t love a candy buffet?!? This is awesome! You have some serious skill & talent. What a beautiful candy buffet!!! You are so creative. I have no grands and just one grown son, so no candy buffet, but I will store this in my memory for the future! Kathleen recently posted…The house, and how it’s coming along. The candy table reminds me of my youth! Now, I want to run out and buy some jelly beans! Your children are adorable! Have a great day, love! What a cute idea. I love the idea of sharing a piece of your childhood with your grand-kids. Thanks, Amanda! It was so much fun! Oh, how fun! You can’t go wrong with candy, for sure! I love the “design” of the buffet, great ideas! Kristen from The Road to Domestication recently posted…Inspirational Easter Printables – FREE! 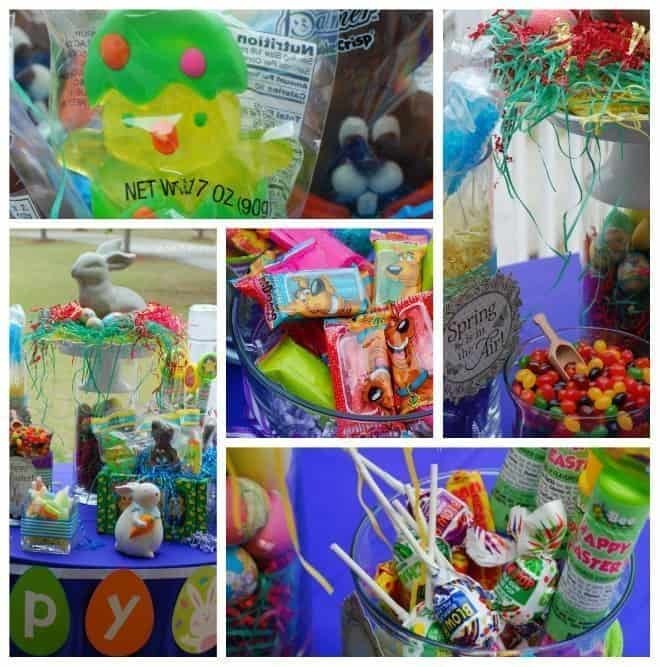 I love the candy table.. I have never had a party with one BUT I’ve been to one w one and they are awesome and so pretty! I just love your ideas! So creative and great pictures! pinning! nadeen recently posted…Vacation Getaway Ideas from Travel Bloggers! Beautiful just beautiful! (not sure about the taste, I do not like candy, so thankful it is not for me ;)). But boy does it look good. And those boys look very happy too. What a super fun idea! And quite adorable as well! Thanks, Bonnie! Heading over to check out your bracelet! Bracelets are my favorite jewelry! What a cool party! I love those little wax bottle drinks. This is a great idea. Thanks for always hosting such a lovely party! What a cute idea! My grandkids would love this. In the long run it might be cheaper than baskets. Thanks for the inspiration. I love rock candy suckers! The table looks great. I remember candy stores and visiting with my parents as a kid too. I love all the colors! Wow! I bet they thought they were in heaven. What a wonderful grandma! I love the red hair! I’m sure they were just fine! Thanks for linking up with the Bloggers Brags Pinterest Party. I have pinned your post to the Bloggers Brags Pinterest Board! Stop spoiling the grankiddos, Alli! But I agree, hey, it is Easter! I have never put together a candy buffet before. Sorry that your favorite store is closed! What a great idea. I didn’t know they still made the wax candies with the juice inside. You are taking me way back. That looks so cool! Beautifully done. 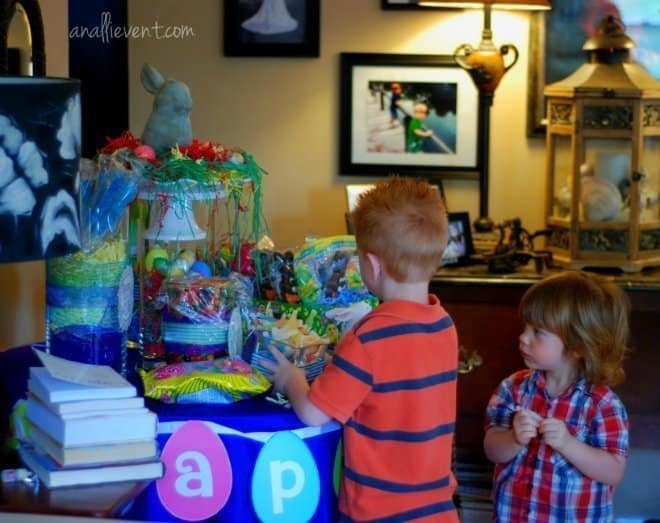 That table just scares me… my 2 yr old always wants to “hold the candy! hold the candy!” (in other words, completely obliterate it then bounce off the walls). Haha. I can see him attacking the table with glee. DIYDanielle recently posted…Review: Image3D Personalized Viewfinder and GIVEAWAY! Ha ha! I had to reign my 2 year old grand son in because he wanted to eat it all!